An elegant bouquet, with fresh sensations of fleshy red fruits such as blackcherry, blackberry preserve, faded rose petals and sweet spices. Fine notes of eucalyptus, toffee, liquorice and chocolate chips follow straight after. On the palate the rich and noble flavour of chocolate fades into the velvety texture of mocha. Warm and extraordinarily smooth at first, in the end it shows off perfect tannins and a marvellous freshness. Amazingly long aftertaste. Layers of delicate cassis, blackberry and cherry give way to the rich intensity of blueberry and blackcurrant. Pleasant floral hints add finesse to the aromatic bouquet, with reminiscents of tobacco and hazelnut. 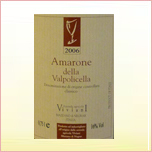 Round and lingering, with velvety tannins that emerge smoothly on the finish. 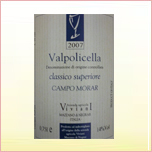 A great Valpolicella, a pure expression of its noble terroir.